Paper flowers are my absolute favorite thing to craft. But paper plants are a close second! Out of all the plants I have made, I would have to say the fern is at the top of the list. In my craft school video tutorial today, I’m showing you some different fern leaves you can make out of paper. I’ll also share some ideas for how to decorate with ferns and how to create paper fern arrangements to use as home décor. In the video, you’ll see some fern DIY projects I’ve made in the past. 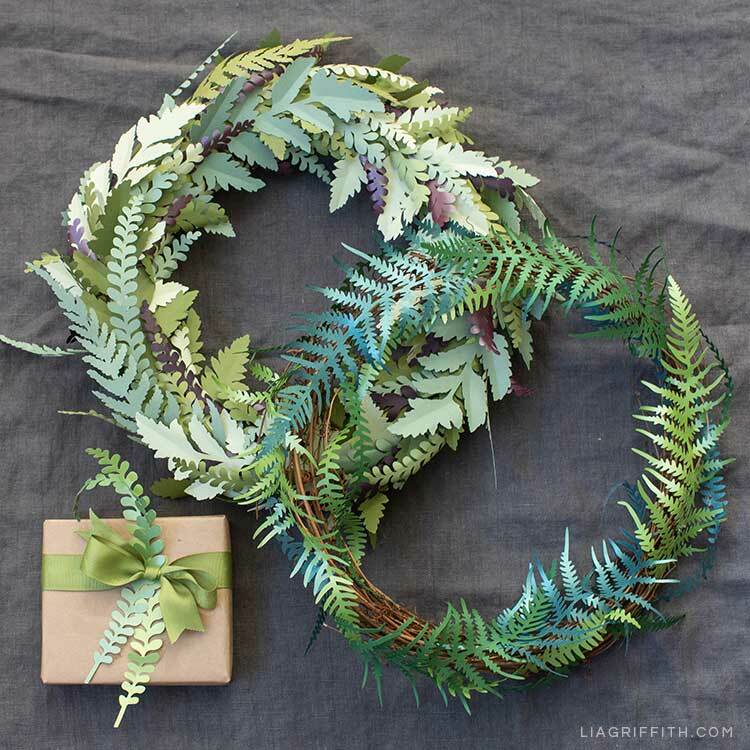 You’ll also learn how to make a new wreath using a fern leaf pattern I designed a few years ago. As you can see from my photos here, there are many ways for you to decorate with ferns and create gorgeous paper fern arrangements. I like to use frosted paper and double-sided crepe paper to give my ferns more texture. And then I bring them to life by curling the paper. In my video tutorial below, I’ll show you how to curl these tiny delicate fern leaves so they look more natural. 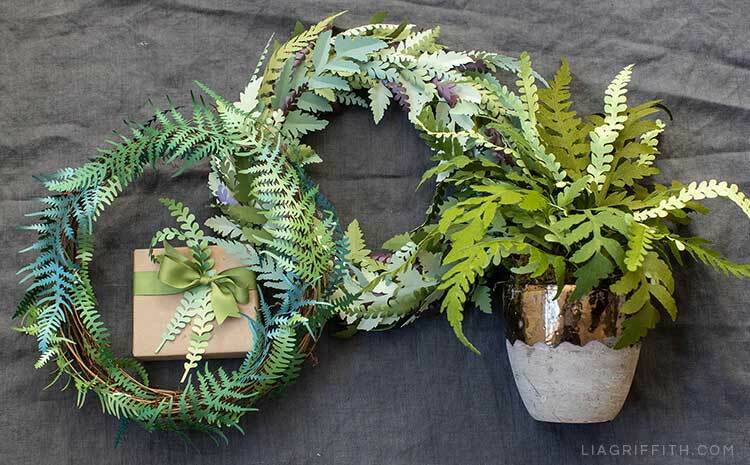 You’ll also learn how to glue your fern leaves onto a grapevine wreath and how to layer the leaves. If you scroll down a bit, you can find the tools and materials I used to create this wreath, the pattern, and then the video tutorial. Toward the end of the video is when you’ll see more ideas for how to decorate with ferns and how to create fern arrangements. I’ve also linked all of the projects shown here below the video. If you end up crafting any of these projects, share them with us! You can post pictures on our Facebook page or post them on your Instagram and use the hashtag #MadeWithLia. Download the leaf pattern here. 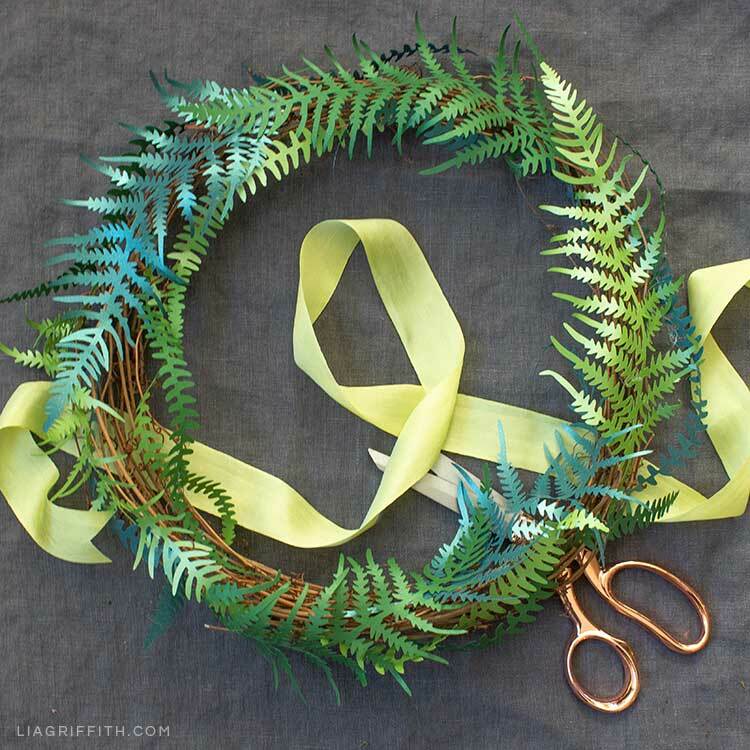 Then watch the video below to learn how to assemble your own paper fern wreath. For daily DIY inspiration, follow us on Pinterest and Instagram. You can also browse our YouTube channel for more how-to video tutorials. To download our DIY templates, SVG files, and photo tutorials, become a member of our crafting community! I love this tutorial… planning to make a paper fern. Thanks so much for sharing your patterns and directions with us for the paper fern.